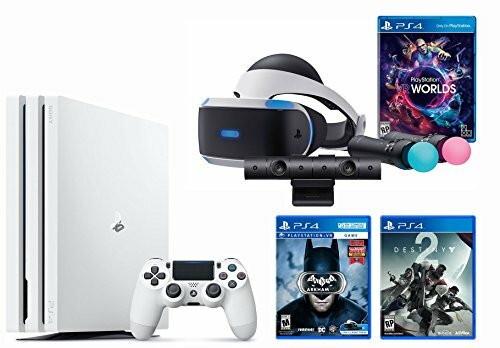 Includes: VR headset, Processor unit, VR headset connection cable, HDMI cable, USB cable, Stereo headphones, AC power cord, AC adaptor, PlayStation VR Demo Disc, PlayStation Camera, 2 PlayStation Move motion controllers, PlayStation VR Worlds Game Disc, PlayStation 4 Pro - 1TB, Destiny 2 Game Disc and VR game disc Batman: Arkham VR - PlayStation 4Redefine your expectations of immersion in gaming with moments so intense your intuition takes over. Step into incredible virtual worlds and overcome new challenges in extraordinary ways. With gamers in mind, PlayStation delivers a new world of unexpected gaming experiences through PlayStation VR. Play some of the most highly anticipated titles of 2016 on PS VR including an all-new Star Wars Battlefront gaming experience and games like PlayStation VR worlds, Golem and RIGS Mechanized Combat League. Getting into PlayStation VR couldn't be easier. Just plug the PlayStation VR headset and your PlayStation Camera into your PlayStation 4 system. You're ready to go.